On the morning of Friday 28th July we could enjoy a sumptuous breakfast buffet at Hotel Astoria before starting our day trip. Each one of us also received a packed lunch prior to our departure which included some sandwiches, fruits and a beverage. The bus was already waiting for us at the entrance of the hotel (punctual as usual!). We were lucky with the weather: it was a fresh but sunny day. We travelled to Kassel’s Bergpark Wilhelmshöhe, a baroque landscape park built by a former local ruler over 240 hectares which recently acquired a UNESCO World Heritage status. The main attraction of the park are the natural waterfalls and fountains that require no electric pumping systems, so they rely entirely on the difference in height and pressure in the water circuit of the park. The first thing that greeted us at the entrance of the park, on top of the mountain, was the Hercules Statue atop the Octagon. From there, we could have a splendid view of the city and the waterfall path all the way down to the castle. The whole water circuit was designed in order to demonstrate the power of man over nature and obviously, to impress the visitors of the local ruler. Unfortunately, we could not revel in the water features through the fountains, as that could be activated only on Wednesdays. A stunning view from the top! However, we could enjoy a pleasant walk downhill through the lush forest to the castle called Schloss Wilhelmshöhe. After the visit of the uniquely decorated interior of the castle (our guide even showed us the weapon room with authentic baroque armours and weapons!) we had a small picnic in the English garden. There we could play some fun games such as hide and seek among the trees. Aidan found a perfect hiding place on the top of a tree, and Rodeo did have a hard time trying to find him! Wilhemshöhe was declared part of the UNESCO cultural heritage in 2013, only 4 years ago! Right after lunch, we visited SMA, a leading company in photovoltaic (PV) systems and one of the biggest employers in Kassel. We had a guided tour of the facilities where they produce from 20 to 30 different models of PV inverters. These inverters have an efficiency of approximately 96% and can support from 1,5 kW (the smallest, weighing 9 kg) to 5 MW (the biggest, weighting 82 kg). We were guided by two members of the staff of SMA, who readily answered our questions on the production and testing of inverters. The plant in Kassel actually delivers around 3000 inverters per week and sometimes even more. We also had a small Power Point presentation on smart home topologies, and we were showed how to use a freely available online tool called “Sunny Design”, so that we could simulate a smart home system. WoQuaz Fraunhofer Institut für Graphische Dataverarbeitung IGD, Weiterstadt – Smart living in practice. On Thursday 29th July we started our long trip with one of the ISU member, Mona Ahlheim, throughout the state of Hessen. The ISU team booked a bus for us so that we could travel comfortably. We were accompanied by Professor Ingo Jeromin and Professor Carsten Zahout-Heil to Kassel. The first stop was at WoQuaz (short for “Wohn-und Quartier-Zentrum”), a smart building in Weiterstadt designed for elderly people and people with disabilities. Fraunhofer Society, a globally well-known applied research organization, is responsible for the smart systems deployed in the 22 private apartments and 11 rooms of the WoQuaz building. We were first introduced through a presentation to the functioning of the embedded sensing and perception systems. We then had a guided tour in one of the private apartments. The floor is fitted with CapFloor, which consists of a grid of wires with sensors at the edges, so the exact location of the resident is known at all times. Thus, when the residents either fall or take abnormally long hours in the bathroom an automatic phone call is made, first to the resident, then to his or her neighbour and, if none of these calls is answered, the staff receives a call. The air quality of the rooms is constantly monitored and the lights can also be turned off in case the residents forget to do so. Furthermore, these intelligent home services not only provide an assisted living but they are also energy efficient. The building uses solar energy for heating up water and rain water for toilet utilities. At first, we thought that all this technology and comfort must be expensive, but the rent for a smart apartment, including internet, landline, heating and electricity only costs around 20€ per sq. meter: the technology implemented for energy efficiency actually reduces the operating costs of the building. After having lunch at WoQuaz, our bus drove us to Edersee. Unfortunately, the sky was cloudy so we couldn’t swim in the lake as expected but the weather was fine enough so that we could enjoy a peaceful view of the lake from the top of the dam and have a stroll in the town. Professor Jeromin and Professor Zahout-Heil both explained the operation system of the hydropower station present there and the history of the dam. Located in North Hessen and operated by E-ON, the Edersee dam was constructed to control the water level of the river Eder. However, it became a strategic target for attacks during the Second World War. At that time, the German had installed nets inside the river, used to catch underwater torpedos. Nevertheless, the British developed “jumping” bombs that rotated at a speed of 400 km/h in order to jump over these nets. As such, the dam was destroyed and the water flowed as far as 30 km downstream flooding nearby villages and killing around 70 people. After the war, the dam was reconstructed and the villages were moved to another area. This explanation concluded our first educational day trip and we used our free time to have some delicious currywurst (sausage with curry topping) and ice cream near the dam before traveling to Hotel Astoria in Kassel. Excursion in Hessen and NRW : 839km, 7 days, 6 cities! On Thursday 27th July we started our long trip with one of the ISU member, Mona Ahlheim, throughout the states of Hessen and Nordrhein-Westfalen (NRW). The ISU team booked a bus for us so that we could travel comfortably. We were accompanied by Professor Ingo Jeromin and Professor Carsten Zahout-Heil in the first part of the trip. After the weekend in Köln, Professor Jeromin would join us again for the second part of the trip. We did all of that! Seven days have proved being rich in experiences, be them at h_da, in Darmstadt, or in Hessen! Let’s find out what some of the participants of the ISU 2017 have felt over this week. National Chiao Tung University (Hsinchu, Taiwan). Moreover, we wouldn’t have had such a good kick-start of stay in Germany if, in addition to the programme manager Jessica Mayer, the h_da student assistants weren’t here. We really owe them not only the good proceedings of the activities planned but also the best tips in town, plenty of nice pictures and lots of good laughs. The English spelling or grammar has not been « corrected » in order to keep the authenticity of the participants records. First lecture of the week focused on Building Information Modelling (BIM) and its applications. We saw example videos of BIM in use and a tool that our teacher advised us to try, such as Autocad A360. The importance of BIM relies on the fact that it can allow us to use augmented reality in smart infrastructures, as we can input it into an augmented reality application in order to enhance human-machine interaction. This is when we visited the laboratory and tried some awesome augmented reality gadgets. One of them is a pair of data glasses, with an integrated screen where images and text can be displayed. We also tried the Microsoft’s HoloLens, and that was a step into the future. The HoloLens at h_da has actually a BIM of the laboratory room, and therefore virtual objects can interact with the surroundings. Once you put on these glasses, a menu displayed on a certain location in the room showed us different “objects” that we could “insert” anywhere the room, such as a virtual cat, a virtual spaceship, a virtual dog… All of this was controlled with a hand motion as a click. The virtual object was then integrated into the room and therefore we could find it even after restarting the HoloLens. The main topic in this lecture is the optimisation of the conversion efficiency in power management. The conversion efficiency of 100% can never be attained, however there are aspects which can be adjusted in order to optimize this value. This course was more technical oriented than any of the other courses before, because we talked about thermodynamics and entropy, thermal cycles, capacitance and inductance problems. It was also useful to get to know typical values for thermal efficiency as well as the relative losses in the transmission of electric energy. These are notions that are more widely used in a professional context than the calculations, currently handled by powerful computing software. The professor explained in such a way that even the students with no previous engineering knowledge could learn some basic principles. Internet of Things (IoT) is fundamental for the new smart cities! The applications are infinite: smart grids, intelligent medical devices, intelligent digital signage, home energy management, traffic flow optimization, logistic optimization… In order to ensure a correct functioning of the latter, the transmission of the data involved has to be secured. This is actually why there are so many debates about IoT and data privacy. We discussed important issues about network security and the potential risks. The most interesting part though was about the encryption methods (symmetric, asymmetrical and hybrid). We realised that current systems are becoming bigger and more complex, and therefore cybersecurity has a key role in the development of smart infrastructures. On Sunday, the 23rd of July, the ISU Team organised a trip to Rüdesheim am Rhein, a charming town in the Rhine Valley. The bus came to fetch us in front of the hotel at 9:20 am sharp as planned (German punctuality!) and we all set off to a new adventure! We were accompanied by our German teachers who prepared some quiz questions over the town for us. That indeed stirred our attention to details that otherwise we would have missed: it was an interactive learning experience as we had to ask questions in German to people around the town about the landmarks and attractions! We were sceptical at first but this eventually became a fun game. A cable car trip up to the Niederwald Monument was our first activity of the day. Gliding over the vineyards, we were awestruck by the landscape… The magnificent view of the river Rhine took our breath away. We could not imagine a better scenery until we reached the top and were standing right in front of the famous Germania monument. An absolutely picturesque view was all around us. Of course, all of these were captured straightaway on the camera – a lot of selfies were made! We then walked through the forest to the Jagdschloss Niederwald Hotel where we had delicious typical German cakes and coffee. Rodeo and Gaetan even tried for the first time the weißwurst, a traditional Bavarian sausage, which they found very tasty. After some rest, we could all set off to ride the chairlift down the hill to the red wine village of Assmanshausen. The pace of the lift was such that we could enjoy the view. It was blissful! Thanks to the quiz questions, we actually knew that the highest point from our feet to the ground was actually 8 meters high. Imagine the goose bumps we got on looking at our dangling feet gliding at this height. A big surprise was waiting for us at the end of ride. A camera made snapshots of us and Gaetan and Aidan who were quick enough to read the “Smile” sign showed excellent acting skills! To end this day, a 45 minutes cruise ship along the Rhine was planned to get back to Rüdesheim. Unfortunately we had to wait for half an hour for the next cruise even if we were the first to reach the dock as an employee from the company told us that the first cruise was reserved for an event. That was the reason why we missed the meeting with the Frankfurter ISU students and since we still had some time to spare, we went to the Drosselgasse to get souvenirs and grab something to eat before taking the bus back to Darmstadt. The baroque style of the buildings in the town was quite peculiar, but undeniably beautiful! The vines covered the walls and door frames, as an echo to the high quality of wine produced in Rüdesheim. Weekend activities #2: Felsenmeer – hiking the mountains! After the climbing park, most of us were still set on to face the challenge of hiking a mountain. We took the train at the Darmstadt Hauptbahnhof followed by a bus. Arriving at the foot of the mountain, we were quite eager to finally see what the Felsenmeer looks like: huge rocks, a result of thousands of years of geological phenomena, were piled all the way up the mountain. The Felsenmeer. Yes, we climbed all of that. The boys and some of the girls decided to climb up the rocks while the rest including Lara opted a relatively easier but longer hiking trail. That was so far the most tiring but satisfying experience we had. The big trees surrounding the path was providing us with shade and the air was definitely fresh. We could all fill up our lungs with clean air! The American boys Gaetan, Alex, Aidan and Rodeo swiftly climbed the rocks as if that was the easiest thing on earth. We were indeed proud to reach the top panting and sweaty. The trees and the huge rocks were striking viewed from top! We found a bar where we could rest and have cold drinks. The descent seemed simple but a few of us slipped while trying to race the others: everyone laughed and cracked jokes all the way down! We had to hurry so as not to miss the bus but then again that didn’t prevent us from stopping along the way and pick up some delicious wild berries known as Johannisbeeren and Blackberries. We managed to catch our bus and retrace our path to the hotel. It was undeniably a nice day and our smiling faces in spite of our aching muscles showed that both activities were absolutely worth the effort. 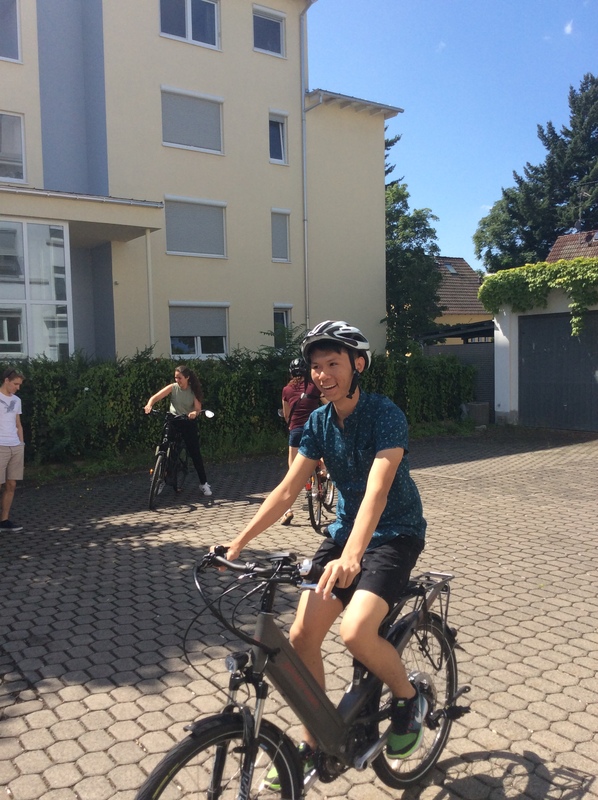 On Saturday, the 22nd of July, I had the chance to take the students of the International Summer University to the climbing park located in Darmstadt. After meeting at Luisenplatz in the early morning and managing the first challenge of the day – to find the hidden entrance of the climbing park – we were welcomed by a friendly trainer of the climbing park who introduced us to the climbing equipment and the safety precautions. For many of the students it was their first time to a climbing park and I was pretty excited to see who would be courageous enough to get into the heights of the trees. After some of the boys dressed up in their climbing gears, we were already feeling like Indiana Jones, we started with the exercise climbing course. It was managed by everyone in a Tarzan-like way. As only 4 people were allowed to stand on the different platforms of the various climbing courses, we split up into smaller groups of 4 or 5 people. Being afraid of heights especially on unstable ground, I chose to be part of the Indiana Jones gang which consisted of Rodeo, Aidan, Gaetan and Alex. With my American guardians, we started our first course which had a difficulty level of red (middle). We were climbing above ropes, surfing on “surfboards” and were brachiating à la Tarzan and Jane from one tree to another. Not all the time these climbing efforts looked graceful but all the more we had to laugh when, for example, Gaetan got tangled up in between two ropes or Alex had to be rescued by a trainer when he got stuck between two platforms. Some of the students unfortunately were afraid of heights and chose to enjoy some muffins that I brought along as well as some drinks. They could however watch the others and laugh heartily about their climbing skills. Motivated by the boys who always cared about me I finally managed to go for the highest difficulty level (black) and overcome my fears of heights. With plenty of funny photos, good memories and talks and some sore muscles we returned to Luisenplatz where Lara, another student assistant, was waiting for the students to do a hiking excursion to the Felsenmeer (see next post). One of the places where we have spent most of our time is in the House of the Energy. All of our classes regarding renewable sources of energy and smart infrastructures are held there. Prof. Dr. C. Jacob gave us an introduction to the Energiewende, the German term for the energy transition. The lecture was separated into two parts – “Introduction to Renewable Energy Systems” and “Introduction to Photovoltaic Systems”. We started by talking about the various types of renewable energies that are used in our respective countries. Prof. Jacob then gave us a few figures about the use of renewable energies in Germany and we were astounded to learn that 30% of the power produced in Germany comes from renewable sources. This was probably the highest figure compared to all other countries present on that day. The main purpose of this first course was to make us aware of the current challenges in order to strike the right balance between energy generation and load consumption and how renewable sources of energy play a crucial role. Prof. Jacob emphasized that efficiency is not only about installing some solar panels and wind turbines, but is more about doing it in such a way that there is a minimum impact on the environment while achieving an optimal energy production. The second set of lectures was focused on Energy Distribution. Prof. Dr. Sebastian Herold was responsible for Gas Distribution and Power Distribution was explained by Prof. Dr. Ing. Ingo Jeromin. Prof. Herold’s lecture was deeply interesting because he explained the geopolitical dimension of gas and how this can impact the security of supply. Gas is one of the most demanded sources of energy in Germany but almost half of it is provided by Russia. We also were introduced to the “unbundling”, how the gas market was liberalised and how the pricing mechanism worked. This was something that not all of us knew, and helped us to understand how the economics of energy play an important role in geopolitical relations. Prof. Jeromin enthusiastically discussed about the electric grid. He explained in details the kind of problems faced by the grid to connect renewable energies. He also told us about several major international projects on the integration of renewable energies in the power grid, such as the Thüga Power-to-Gas Plant, that takes electricity and feeds gas into the distribution grid in Frankfurt, and the Desertec Project. The latter project focuses on how to build a European and North-African super grid, made up of only renewable power sources! Our last lecture of the week was on e-Mobility taught by Prof. Dr. Christian Weiner. We got to know that the main motivations behind e-Mobility are not only environmental, but also economical. We discussed the wheel-to-wheel approach, which considers the whole chain from the mining of the raw materials to its use for generating traction energy in cars. This approach was used in order to explain the close link between renewable energies and e-Mobility, as the latter cannot exist without being powered by the former, and since renewable energies need e-Mobility in order to store the surplus of energy that may be produced. The second part of the lecture was more technical, as we learned about the components and systems present in electric vehicles, and the drive train structures that can allow for different operating modes. The practical part of the lecture was the most didactic of all since we could try several electric vehicles designed and built by the students in h_da at the House of the Energy! 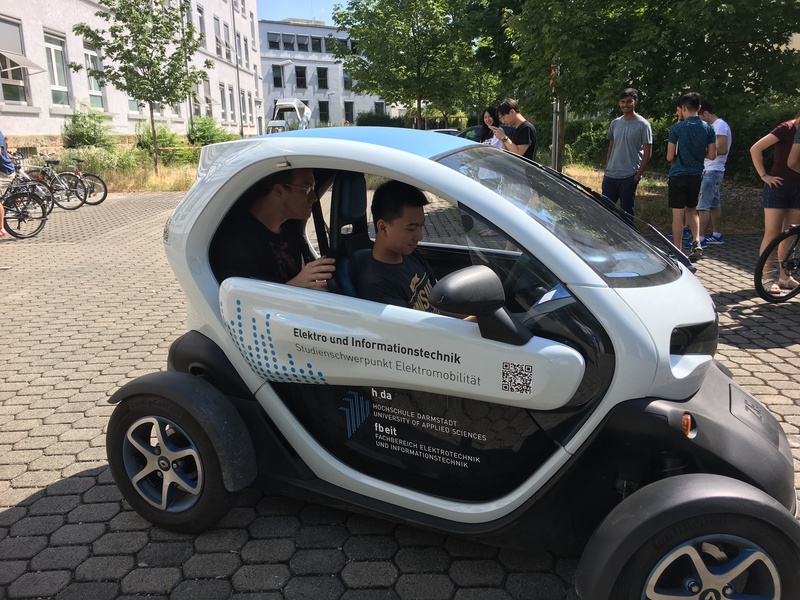 After an exciting hour, we were happy to have experienced on our own the e-Mobility concept and practice smooth driving with electrical engines which are as powerful as some combustion engines. After three days of German, we learned the basics such as the alphabet, counting (really useful!) and finally how to introduce ourselves in the simplest way. The students with previous knowledge on German language were given additional learning materials and were encouraged to apply for the TestDAF exams. Our days are always well organised, for example, we are lucky to be given German classes along with the energy classes. Although for complete beginners the German language course can seem quite tough, it thrills us to be able to understand and communicate even with a few words in a new language. There is no better opportunity for us to get such practice since we hear it every day all over the places that we visit. A warm welcome from the International Summer University (ISU) team was waiting for us at the Frankfurt airport on our arrival day. Many of us were then setting foot for the first time on German soil. We were all experiencing mixed feelings of fear and excitement but every faces were definitely eager for this promising well-organised four weeks stay in the city of Hessen. We were accompanied by the ISU members to Hotel Atlanta where we received our Darmstadt Travel Card right from the first day. This card would allow us to travel to wherever we wanted to go in Darmstadt during our one month stay! Our first morning started with a rich buffet breakfast at the Hotel where we could eat to our heart’s content. We were then escorted by the ISU team to the building where our welcoming ceremony would be held at the Hochschule Darmstadt. On reaching the meeting room on the 14th floor, the breath-taking view of the city captured everyone’s attention. Finally we got the chance to meet Mrs Jessica Mayer in person, the ISU programme coordinator. She greeted each one of us with a big smile. We were addressed by Professor Dr. Ralph Stengler, the President of Hochschule Darmstadt, by Professor Dr.-Ing. Bernhard Hoppe, the dean of the Faculty of electrical engineering and by one of the lecturers, Professor Dr. Ingo Jeromin with whom we shall have classes. They all welcomed us whole heartedly, informed us of our 4-week schedule in detail and outlined the major achievements of Hochschule Darmstadt which were certainly of great interest to all of us. After the introduction, we were given our on-campus Wi-Fi access and of course, some insights of the fun part of the programme. The president himself fully encouraged us to participate in the leisure activities in order to get the best from our stay in Germany. At lunch time, the ISU team showed us the mensa where we could get a variety of healthy lunches at a low cost every day. In the afternoon, we were introduced to our German language teachers who rated the German level of each participant and classified us into two groups: a complete beginners group and a mixed one. The learning materials for the German language class were then handed over to us. After the opening event, we went for a guided city tour with Mr Gerhart who told us about the history behind the magnificent monuments and impressive architectures of the city of Darmstadt. We were charmed by the striking interior of the Church of Tolerance and the well-sculpted buildings in Mathildenhöhe. This wonderful first impression of Darmstadt was followed by a sumptuous welcome dinner at the “Braustübl” with the ISU team where we could choose among typical German dishes and we got to taste a wide variety of famous German beers. We all seized this opportunity to get to know each other better. There could be no better ending to this marvellous day. The ISU team prearranged an intercultural training session which was instructed by Anna Corbett, a very friendly lady. It was a highly interactive class aimed at not only preparing us to better understand the German culture but also at sharing our own common interests, our different views of the German culture as well as our expectations and goals in joining the ISU programme. We were taught about how to interpret and react to different situations with an open mind set through fun activities. We finally got to know why Germans are so punctual: for them time is personal property. Important values such as punctuality and good sense of organisation are instilled in them right from their childhood. We learned how punctuality is vital to properly plan one’s time well ahead. Moreover, we got acquainted with several German etiquettes. For example, it is considered very impolite in Germany to interrupt a person who is talking or not letting someone finish his/her sentence: something which is quite common in other cultures. We learned that the German success lies in their undisturbed focus while working and how they value predictability: Germans are honest, direct and tend to stick to their plans. This is the basis in establishing an environment of trust among them. Also, they have a clear distinction between work and private life. It is well known to us now that Germans are not shy but they prefer to respect other’s private spheres. We were inspired to step out of our comfort zones and mingle with the Germans as once you break the ice, you have true friends for life!